This event is going to be epic and awesome. Join us! I’m part of a group of alternative female authors–dark fiction writer chicks, if you will. And we brainstormed an idea: What if we put together a multicultural celebration of horror, paranormal and dark fantasy? 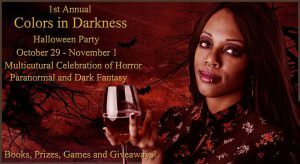 Of course, we all agreed and after much discussion and planning, we announce the 1st Annual Colors in Darkness Facebook Party. Come join the fun beginning on October 29th. My personal takeover for the even will be on Saturday, October 31 at 6pm EST and 10pm GMT. Find the details here.